"The most beautiful things in the world are ours to hold!" Easels by Amron offers decorative and display table top easels and floor easels in over 300 styles, sizes, and colors. Our easels are designed to properly and elegantly display your art and collectibles in your home or business. All easels displayed on Easels by Amron are our original designs, concepts or adaptations. Don't be fooled by imitations. Always buy from Amron, Inc. and get the original - the real thing! EASEL (pronounced ezel): A frame for supporting anything. Amron has been the mark of quality and service since 1939. Having a need to display artwork, the first of many new and unique designs was "Easel does it", our patented hold anything easel. Easels by Amron and the term "easels" was born at this time (June 1st, 1978). Easels by Amron manufactures its Easels in reliable factories located in the United States, Taiwan, and India. Amron has been manufacturing and selling easels for almost 30 years. Most other web sites you may see online are distributors of our easels. We offer wood easels, wire easels, acrylic easels, metal easels, wrought iron easels, brass easels, plastic easels, copper easels, pewter easels, chrome easels, table top easels and floor easels. We have display easels for your desk, shelf or wall. Over the years we have sold easels to virtually everyone from Elton John to the Pope! Amron has been making quality easels since 1978. 10-31 Inccorporated, a leader in the display products business, purchased Easels by Amron from Alan Angell in 2012. For over 30 years 10-31 Incorporated has been a manufacturer of quality display products. 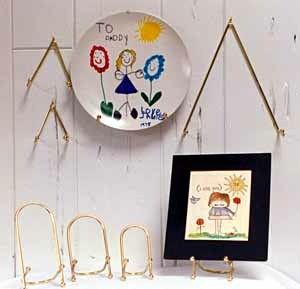 We offer a wide variety of products such as plate and bowl stands, jewelry stands, display cases, risers, and armature holders. We are sure to have an easel for you.